Who We Are - Quake Up! We, in the Pacific Northwest Region recognize the need and benefits to being emergency prepared on all levels which is the basis and foundation of our participants. The advocacy for Resiliency Plan includes seismologists, geologists, businesses, State and federal agencies and various other agencies and supporters/voices to this plan. The primary goal is to broaden the current scope and efforts to make it possible for the entire region to "bounce back faster" for the purpose of benefitting everyone to stay in place and resume working and living here without losing a large population due to massive deaths, little to no commerce and work possibilities, or lack of infrastructure/utilities to support the people and businesses. We are determined to take efforts to reduce the damage caused by natural hazards like earthquakes, floods, droughts and cyclones, through an ethic of prevention. Case in point is the San Francisco, 1906 Earthquake and fire devastated the city and moved the people and commerce to Los Angeles or Hurricane Katrina in New Orleans, ten years later, 25% of the population has not returned, verses the recent Chile or Tokyo earthquakes with minimal loss in life and business disruption due to the efforts made by improved.building codes, infrastructure, etc. We intend to work with our local Washington Commissioners, City Mayors, Oregon State legislators, FEMA. This includes Washington State as well. Our emphasis is to work with government decision and policy makers from local, state and federal, along with businesses, small and large, and communities in preparedness and mitigation efforts. We would appreciate working with you to schedule a briefing and other outreach. Gerry Williams - Public Member, Construction & Engineering Management Research, Inc.
​*Retired from the commission in June 2012. 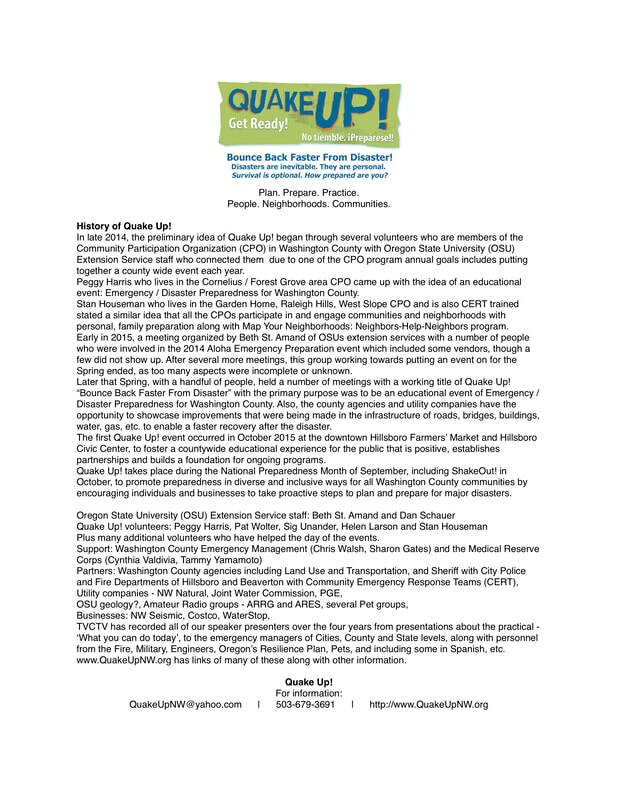 CREW is a non-profit coalition of business people, emergency managers, scientists, engineers, civic leaders, and government officials who are working together to reduce the effects of earthquakes in the Pacific Northwest.